It's a tough call whether I'm more inspired by the tomatoes or the corn at the farmers market this year. In many ways, I feel like the corn recipes I'm turning out are more interesting. This corn risotto was inspired by a recent post on the Washington Post's All We Can Eat food blog. 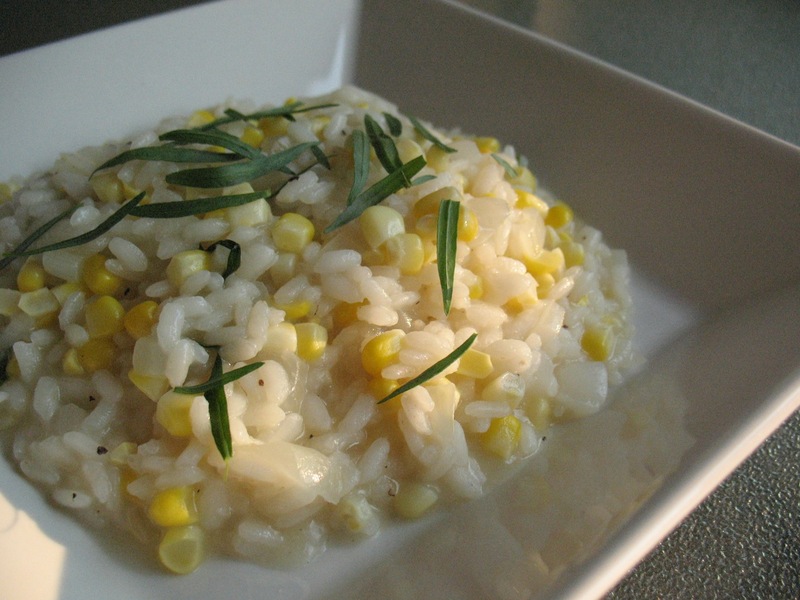 I thought it was a really good idea and, having had great success infusing milk by using corn and corn cobs, I figured making corn broth for risotto would work well that way too. And I was right. The corn broth just by itself was delicious. I imagine it would be perfect for some kind of corn/seafood soup. If I wasn't headed away for the weekend, I would have saved the unused broth and experimented. 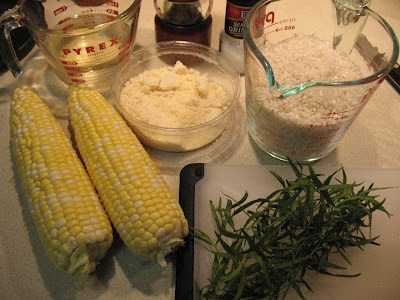 And while the corn is still around, I just might try to whip something up. Before I get to far ahead of myself, back to risotto. I like my risotto to be pretty firm and not too soupy, so I don't add extra butter or cream at the end, as I prefer the starchy creaminess that develops from the rice and stock with some parmesan tossed in at the end. If you like it richer, feel free to add those things at the end. 1. In a large pot, combine 8 cups water with the kernels from 2 ears of corn, the 2 reserved cobs cut in half and 2 tsp. salt. Bring to a boil, reduce heat, cover and simmer for an hour. Remove the cobs and strain out the corn kernels. This will make about 2 cups extra corn broth that may be saved for another purpose. 2. In a large dutch oven or deep-sided sauté pan, heat butter and olive oil over medium heat. Add onion and sauté until softened, about 10 minutes. Stir in the rice and continuing cooking to lightly toast rice, about 5 minutes. 3. Add the wine and cook, stirring frequently, until it is absorbed (the bottom of the pan will be dry when the rice is pulled away with a spoon). Add 2 cups of corn broth to rice and cook, stirring frequently, until the broth is absorbed. Continue adding broth, about 1/2 cup at a time, waiting to add additional broth until each addition is fully absorbed. After about 2 cups more have been added (4 cups total), stir in the remaining corn kernels (from two ears of corn) and half of the tarragon. Season with salt and pepper. Continue adding broth and stirring as it cooks. Taste rice--dish is done when the rice has the consistently of al dente pasta. Do not overcook. Stir in parmigiano-reggiano and serve sprinkled with remaining fresh tarragon.